The room is small and cosy, and warm light fills the apartment. An upright piano speaks to us of the artist we are about to meet. In her little haven, located a few steps from the Cairo Conservatory, Elena Dzamashvili plays a short passage from Chopin, her favourite composer. She lifts her eyes from the piano keys and runs them over the wall above, where the faces of dozens of composers and musicians with whom she played look back to her from innumerable photos and posters. They tell many stories, bearing priceless memories of the many musical journeys the artist took, on which she invited audiences on many stages across Egypt. Her eyes shine as she reflects, “When I play Chopin, I play with my heart. It’s hard to explain… He speaks through me and through my emotions. I feel him deep within my soul.” Dzamashvili includes Chopin in many of her concerts, like her most recent recital on Thursday 5 March. She played Beethoven’s Sonatas Op. 17 No. 2 and Op 57 in the first half of the evening, and Chopin’s 24 Preludes Op. 28 in the second half. Though she admires Beethoven as well, she relates to him at a different emotional level, experiencing a different kind of intimacy. “Beethoven speaks about life and nature; the musical themes fight with each other, his music can become very dramatic, on the verge of being tragic. Of course Chopin is dramatic as well but in a different way, his music is more personalised,” the pianist comments on her choice of programming, drifting back into her meditations on Chopin. “Chopin’s Preludes represent life. At times they are tragic; at other times they embrace you with love and happiness.” Dzamashvili played the Preludes as they are collected in one single opus, passing through the composer’s well designed emotional sketches, some of them under one minute. In the 24 preludes continuously interchanging major and minor scales, we indeed experience joy, happiness, a bright romanticism as well as loss, fear and desperation; we encounter a duel and a funeral; we suffer uncertainty and let ourselves be taken by melancholy. Dzamashvili uses each of the preludes to mould the relevant emotion and pour it into the listener. Sampling every note, she shapes each prelude individually, creating sharp contrasts that stress bravura on the one hand and desolation on the other. She leaves us immersed in the Chopin’s genius embodied in a pianist’s clarity of vision and sheer technical brilliance. Indeed, the journey through the preludes in Dzamashvili’s hands is an encounter of life in its entirety and all of its colours separately. No wonder the audience did not want the pianist to leave the stage, asking for three encores and getting a Chopin waltz each time. Naturally, Chopin is a recurrent motif in Dzamashvili’s career. Today, she plays all of his works: all the etudes, preludes, scherzos, ballades, waltzes, sonatas and both concertos with the orchestra. Added to other composers, this makes Damashvili as fascinating as the music we listen to each time she steps on the stage. Born in Georgia to a pianist mother, Elena was only three years old when she started exploring the instrument. “As a child I used to listen to the radio and then transfer the music onto piano, regardless of how challenging the melody and the harmony were,” she recalls, pointing to how it was then that her mother discovered that she, the youngest of three daughters, had perfect pitch. Yet both Elena’s sisters are musical: one is a piano teacher at the Tbilisi Conservatory, the other studied music theory. 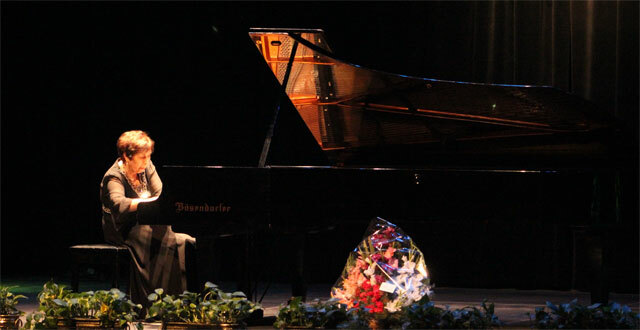 Looking back to the days of her studies in Tbilisi, Dzamashvili remembers how the world-renowned pianist Tatiana Goldfarb came to have a special place in her heart. Laureate of the 3rd International Frederic Chopin Piano Competition in Warsaw (1937), the first pianist from the then Soviet Union to reach those ranks. Teaching at the Tbilisi Conservatory between 1958 and 1964, Goldfarb spotted a talented girl and took her under her wing. “She believed in me and worked with me on a repertoire for big competitions. It was she who gave me Chopin,” Dzamashvili says, recalling her journey to join the International Frederic Chopin Piano Competition, which required passing a number of selection stages, first inside Georgia, then on the Soviet Union level. “I worked on an extremely big repertoire and made it all the way to the top of the Soviet Union. With a few other young people, I was chosen to go to Warsaw for the final competition. Unfortunately, an unexpected health issue stopped me from actually travelling,” Dzamashvili tries to show that time has healed that regret. For many years, Dzamashvili taught at the Tbilisi Conservatory, performing regularly with the Tbilisi Symphony Orchestra. Following in her mother’s footsteps, she also started working at the Georgia Radio and Television Company where she made over 600 recordings which continue to be aired regularly today. In 1990, she was awarded the title of Honored Artists of Georgia. Her resume also includes concerts in the USA and France, among other countries. The crucial change in Dzamashvili’s life took place in 1991. As part of the active cooperation between the Cairo and Tbilisi conservatories, she was offered to work in Egypt. 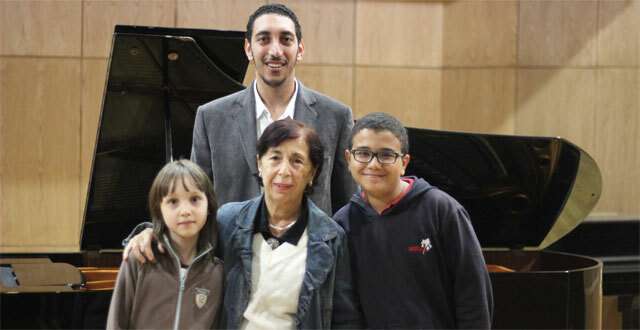 She brought along her son who, having completed his education at the Tbilisi Conservatory, is now a viola player at the Cairo Symphony Orchestra. At the Cairo Conservatory, Dzamashvili teaches piano and chamber music. She also teaches at the music department of the American University in Cairo and at the Talents Development Centre under the Cairo Opera House’s umbrella. Leading a dynamic life, she continues to play, presenting solo recitals, accompanying other musicians and with the Cairo Symphony Orchestra. The pianist moves across the room, pointing to photos of her students and posters from her concerts: a life filled with accomplishments, dedicated to music in every form. Not only does Dzamashvili play a large repertoire, she also enjoys compiling programmes thematically. “In 2010, we celebrated the 200th anniversary of Chopin’s birth, a year later it was time for Liszt’s 200th birth anniversary…” She reminisces, standing before the many names which, like a memory map, fill the room’s wall. Among them is a poster promoting a concert commemorating Schumann’s 200th birth anniversary in 2010. Beside it there are references to the work of Mozart, Brahms, Rachmaninoff, Tchaikovsky, Debussy and Gershwin, together with many lesser known composers weaved into several programmes. There is a French music evening and Chopin waltzes. Next to solo recitals, we see Dzamashvili’s name in chamber formations including the Egyptian Piano Quartet which brings her together with three other pianists: Eman Samy, Ghada Shaker and Dina El-Leithy. Dzamashvili’s life is embedded in classical music. Born and raised in a country where this music is cherished by the majority, where it is played abundantly on the radio and on television, where concerts are fully sold out most evenings, she feels that Western classical music faces many challenges in Egypt. As a result, Dzamashvili points to the importance of promotional activities: “The advertisement is not always clear and the information available does not always reveal the details of the concert. There are fascinating gems among the Cairo Opera Small Hall’s events, and they deserve to be highlighted in all available media,” she says, hoping the situation will improve in the next few years.